The shoe brand is putting its foot down. When you think of Converse&apos;s Chuck Taylor sneakers, what comes to mind? Images of old school basketball players or greasers in white tees and jeans? High schoolers on their way to Warped Tour? How about the words "iconic" or "classic"? That&apos;s what the shoe brand is betting you think. On Tuesday, Converse filed lawsuits against 31 retailers and manufacturers with the U.S. District Court in Brooklyn and the International Trade Commission. The defendants include everyone from H&M, Kmart and Fila to Shenzhen Foreversun Industrial Co. and Nowhere Co. Ltd -- a mix of global retail powerhouses and little-known companies based in China and Japan. Converse is taking issue with the way these retailers and manufacturers have styled the toe bumper and cap of their sneakers, along with the upper and lower stripes along the bottom of the shoe. All four elements are trademarked and, according to Converse, haven&apos;t changed since 1932. That the shoes have been kicking around for nearly a century is both the weakest and strongest part of Converse&apos;s argument in these lawsuits. 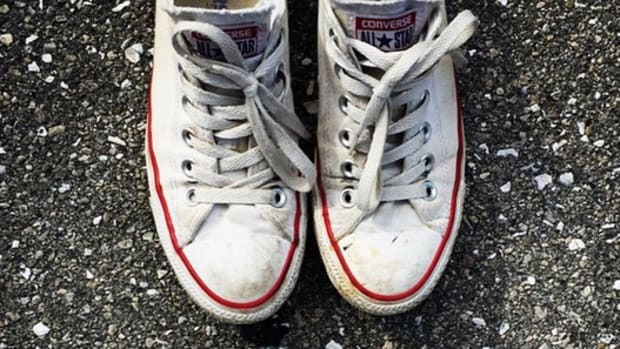 According to Susan Scafidi, a Fordham Law professor specializing in fashion law, that&apos;s a long time for other brands to knock off its designs, weakening Converse&apos;s ability to claim its Chuck Taylor design as distinctive. That said, selling the same design since the &apos;30s has also given Converse ample time to establish itself as an icon in American culture. And that&apos;s really what the brand&apos;s case rests on, Scafidi says: The ability to prove that the design of its shoes has taken on a secondary meaning to consumers. That is, reached icon status. Converse has ramped up efforts to protect its trademarks in recent years, aided by the backing of Nike, which acquired the label in 2003. Converse has sent out over 180 cease-and-desist letters to competitors since 2008, a rep says. It did go to court with the Dallas Cowboys in the &apos;90s over its blue star logo, but the case was settled out of court in 2000. So why file 31 lawsuits all at once? It&apos;s attention-grabbing, to say the least. A company only does this when it&apos;s trying to make a substantial public statement, Scafidi says. But it&apos;s doubtful that all the cases will go to court individually, she notes. More likely they will be aggregated or settled out of court. With sneakers&apos; current resurgence in popularity, it makes sense that Converse&apos;s attention would turn to protecting itself against copycats. Its entire brand rests upon that one style, so trademark infringement needs to be a part of its business strategy. While the brand's sales growth slowed, the all-American sneaker brand took off in the third quarter. Litigation of this kind is costly. Here's why the ailing teen retailer is taking on the Swedish behemoth.